Fog, Fog, Fog, that’s what happens every morning in this weather pattern. Our plan is to stay on the hook until 11:15AM when the current goes to slack. That way we do not have to lift anchor in the strong current that inhabits this pass. Although the current is predictable, the fog is not. The forecast calls for the fog to lift late morning, but the recent pattern around here is that it takes until around 1PM before the sun conquers the fog. Arctic Star made her way from the anchorage out into Blackfish Sound (named for the Orcas) where the wind was still and the water perfectly calm. Nothing but the seabirds were out and about. During the previous two days, we spotted humpback whales in these waters, but today not a sound nor a sighting. Dusky Cove is a small depression in Bonwick Island and lies at the east end of a group of small islets. The pass to Dusky Cove is through these islets but the channel is deep and well charted. 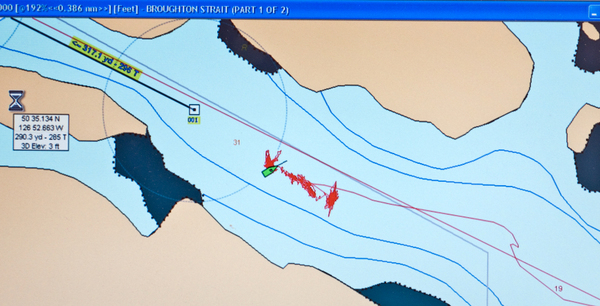 One needs to pay attention to the charts and keep an eye to the small outcroppings of granite as they pass, but in no time you drop your anchor in one of the most visually interesting spots in the Broughtons. Given the large number of islets we decided to make our first exploration in the dinghy. Later, during a low tide we would come back to the most promising spots. This cove put on a spectacular show at sunset, surrounding us with tree topped granite outcroppings cast about in a sea and sky of crimson and orange.